'Annandale', originally the Charles Albert Stevens estate built c. 1896 in Old Westbury. Stevens died before the house was completed and it was purchased by Charles Tracy Barney, president of the Knickerbocker Trust Co., and a member of Rogers & Gould, stock brokers. Barney was married to Lilly Collins Whitney, sister of William C. Whitney who resided on the adjacent estate. Click HERE for Christopher Gray's Streetscapes column on C.T. Barney who committed suicide in November 1907 following The Panic of 1907. The home was later owned by William Goadby Loew who in 1934 hired Walker & Gillette to design alterations and renamed the house 'Loewmoor'. Loew was married to Florence Baker, daughter of George F. Baker of 'Viking's Cove' in Lattingtown. Click HERE to see where 'Annandale' stood on google earth. I bet that circular garden feature is now the point on Applegreen Rd. that bends a little eastward as you're going north. The concrete balustrade is still intact. C.T. Barney also owned 'Windy Barn', originally the William Sprague Hoyt estate on First Neck Lane in Southampton, built c. 1880. 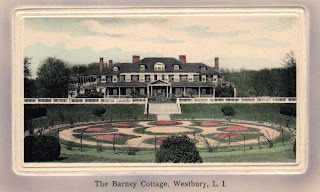 Barney purchased the residence c. 1900 and greatly enlarged the house. The following year the home suffered a devastating fire that forced the Barney family to flee in the middle of the night and caused $250,000 in damages. The NYTimes called the house "one of the finest residences on the Long Island Coast, and was the first Summer home to be built at Southampton." Based on what I've found the house and garden stood in the same footprint of Loewmoor and today were the current property stands. The circular garden was oriented to the south and incorporated into the Olmsted redo for Loew. Parts of that redesign still exists. How many "Annandales" were there on the the north shore?